Roles for excitotoxicity and inflammation in Alzheimer's disease have been hypothesized. Proinflammatory stimuli, including amyloid β-peptide (Aβ), elicit a release of glutamate from microglia. We tested the possibility that a coagonist at the NMDA class of glutamate receptors, D-serine, could respond similarly. Cultured microglial cells were exposed to Aβ. The culture medium was assayed for levels of D-serine by HPLC and for effects on calcium and survival on primary cultures of rat hippocampal neurons. Microglial cell lysates were examined for the levels of mRNA and protein for serine racemase, the enzyme that forms D-serine from L-serine. 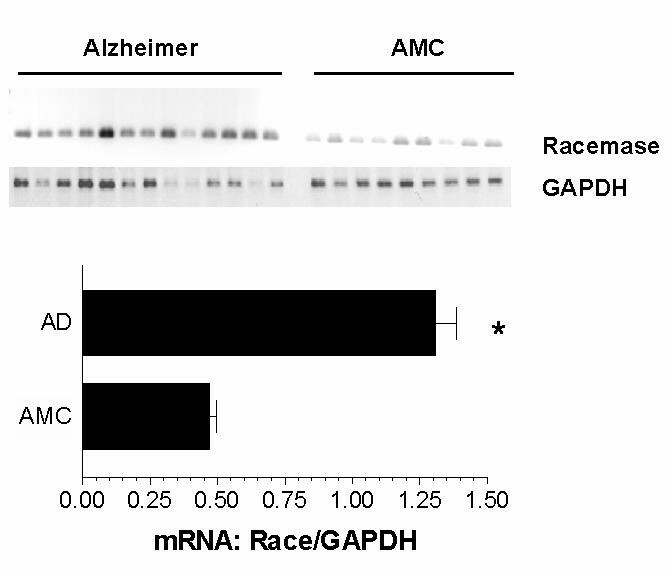 The racemase mRNA was also assayed in Alzheimer hippocampus and age-matched controls. A microglial cell line was transfected with a luciferase reporter construct driven by the putative regulatory region of human serine racemase. Conditioned medium from Aβ-treated microglia contained elevated levels of D-serine. Bioassays of hippocampal neurons with the microglia-conditioned medium indicated that Aβ elevated a NMDA receptor agonist that was sensitive to an antagonist of the D-serine/glycine site (5,7-dicholorokynurenic acid; DCKA) and to enzymatic degradation of D-amino acids by D-amino acid oxidase (DAAOx). In the microglia, Aβ elevated steady-state levels of dimeric serine racemase, the apparent active form of the enzyme. Promoter-reporter and mRNA analyses suggest that serine racemase is transcriptionally induced by Aβ. Finally, the levels of serine racemase mRNA were elevated in Alzheimer's disease hippocampus, relative to age-matched controls. These data suggest that Aβ could contribute to neurodegeneration through stimulating microglia to release cooperative excitatory amino acids, including D-serine. Alzheimer's disease (AD) involves neuronal cell loss and reductions of synaptic density in specific brain regions. Some of the pathological signatures of AD implicate the process of excitotoxicity. For instance, glutamate receptors are altered in the AD brain , which also shows evidence of activation of the calcium-triggered protease calpain . A glutamate receptor antagonist can reverse deficiencies in synaptic transmission in a mouse model of AD . Elevations in glutamatergic stimulation may also contribute to several other neurodegenerative conditions . Most excitotoxic paradigms involve NMDA receptors, complex ligand-gated calcium/sodium channels. In addition to glutamate, the NMDA receptors require a co-agonist at a second site. Glycine has been the most extensively studied ligand for this site. However, D-serine shows an approximately three-fold greater potency than glycine at this site [5–7]. D-serine satisfies several criteria for a neurotransmitter or -modulator at NMDA receptors: selective localization, controlled release, and physiological effect. Inactivation of D-serine by D-amino acid oxidase (DAAOx) markedly reduces NMDA neurotransmission as monitored by NO synthase activity and electrophysiology in ex vivo cerebellar and hippocampal preparations . Furthermore, injection of D-serine can modulate NMDA receptor function in vivo [9, 10]. D-serine is generated from the more prevalent L-serine by serine racemase (EC 5-1-1). Regulation of expression of serine racemase has not been characterized, but under normal conditions the enzyme is localized to the D-serine-containing protoplasmic astrocytes in areas of the brain rich in NMDA receptors . We recently reported that some of the derivatives of the β-amyloid precursor protein (βAPP), including amyloid β-peptide (Aβ), can stimulate glutamate release from microglial cells . Aβ has been reported by many laboratories to activate an inflammatory phenotype in microglia, including the elevation of phagocytic activity, cytokine expression, and production of NO and reactive oxygen species [13–15]. Because of the ability of D-serine to cooperate with glutamate in physiological and pathological stimulation of the NMDA receptor, we tested whether proinflammatory stimuli could influence the synthesis and/or release of D-serine in microglia as well. Aβ1–42 was purchased from Anaspec (San Jose CA). Lyophilized peptide was dissolved in anhydrous dimethyl sulfoxide at 2 mM, diluted with minimal essential medium (Earle's salts) (MEM) to 150 μM and incubated 16–24 h at 37°C. Recombinant sAPPα was produced and purified as described previously . Lipopolysaccharide (LPS) and 5,7-dicholorokynurenic acid (DCKA) were from Sigma (St. Louis MO). D-amino acid oxidase (DAAOx) was from Worthington Biochemicals (Lakewood NJ); for heat-inactivation controls, DAAOx was incubated for 15 min at 80°C. The antibody against serine racemase was from Becton-Dickinson/Transduction Laboratories (Mississauga ON). Primary microglia were obtained from mixed glial cultures generated from neonatal Sprague-Dawley rats as described previously . Briefly, cortical tissue was dissociated and plated in MEM supplemented to 10% with fetal bovine serum (FBS), 0.5 mM L-glutamine, and 10 μg/mL gentamycin. After 10–14 days, microglia were removed by vigorous lavage and plated into secondary culture. A second lavage 30 min after secondary plating removed the astrocytes and oligodendrocytes; resulting secondary cultures were >95% microglia as determined by staining with Griffonia simplicifolia isolectin B4 and glial fibrillary acid protein (GFAP; exclusionary). For RNA or protein harvest, cells were plated at 4 × 105/dish in 35-mm dishes. For collection of conditioned medium, cells were plated at 2 × 105/well in 24-well plates. Cultures were changed to serum-free MEM before stimulation. Primary cultures of hippocampal neurons were established from E18 Sprague-Dawley rats as described previously . Cultures were maintained in Neurobasal/B27 (Invitrogen) for 8–10 days before use in experiments. The N9 mouse microglial cell line (courtesy of P. Ricciardi-Castagnoli, Milan) and the HAPI rat microglial cell line (courtesy of J. R. Connor, Penn State U.) were maintained in MEM/10% FBS. Reverse-phase HPLC was used to separate and detect D-serine in samples of conditioned medium, similar to the methods of Hashimoto et al. . For these experiments, microglia were switched to MEM in which the concentration of L-glutamine had been reduced to 10 μM; otherwise, the glutamine elution peak obscured that of D-serine. Samples were derivatized by a 3:7 mixture of solution A (30 mg/mL t-BOC-L-cysteine, 30 mg/mL o-phthaldialdehyde in methanol):solution B (100 mM sodium tetraborate solution, pH 9.4). Resolution was achieved on two consecutive 4-μ NOVA-PAK C18 columns (Waters), 100 and 300 × 3.9 mm, respectively. A linear gradient was established from 100% buffer A (0.1 M sodium acetate buffer, pH 6; 7% acetonitrile; 3% tetrahydrofuran) to 100% buffer B (0.1 M sodium acetate buffer, pH 6; 47% acetonitrile; 3% tetrahydrofuran) over 120 min at 0.8 mL/min. Fluorescence was monitored with 344 nm excitation and 443 nm emission. Total RNA was isolated from microglial cultures and 1 μg was reverse-transcribed using the "Advantage RT-for-PCR" kit (Clontech); 1 μL of this product was used in PCR reactions with Clontech reagents. Serine racemase mRNA levels were often so low as to require a two-step PCR to avoid nonlinear effects of reagent depletion; the first PCR was 10 cycles and the second utilized 10% of this product in a 25-cycle reaction. Primers were designed to span an intron/exon junction. Mouse racemase; forward: 5'-GTT ACT CAC AGC AGC GGA AAC C; reverse: 5'-GAG GGC TCA GCA GCG TAT ACC (annealing at 61°C). Rat racemase; forward: 5'-TAG CGG GAC AAG GGA CAA TT; reverse: 5'-TGC ATA CTT GAT TTC ATC TTC CGT G (annealing at 61°C). Human racemase; forward: 5'-CTA TCC ACC TCA CAC CAG TGC TAA C; reverse: 5'-ACA ATT GAC GCT CCG TAG GCT (annealing temperature: 71°C). Equivalency of input was confirmed by RT-PCR for GAPDH as described previously . Total mRNA was obtained from hippocampus of twelve persons (38% males, ages 60–92) diagnosed with Alzheimer's disease by CERAD criteria. Nine (9) age-matched controls (AMC) (87% male, ages 59–97) were free of other neurological conditions and heart disease. Cell culture lysates were analyzed for serine racemase by immunoblotting techniques described previously , with the primary antibody diluted to 1:200. Blots were digitized on a conventional scanner. The serine racemase sequence representing nucleotides 1511 upstream of the start of translation was cloned from the T98G human cell line; fidelity was confirmed by sequencing. This sequence was fused to the coding region of firefly luciferase in pGL3-basic (Promega) to create pGL3-RaceProm. The pRL-TK vector (Promega) was used as a cotransfected control for transfection efficiency and cell survival. For each 2-cm2 transfection well, 2 μL Lipofectamine 2000 (Invitrogen) were mixed in MEM with 300 ng pGL3-RaceProm, 10 ng pRL-TK, and 690 ng miscellaneous DNA, and this mixture was incubated at room temperature for 20 min. The mixture was applied to HAPI cell cultures for 2 h, then removed by a medium change to fresh MEM with or without agonists as indicated. After an additional 24 h, a lysate of each culture was assayed sequentially for firefly luciferase and Renilla luciferase activity with a commercial kit (Promega). Primary neurons were assayed for intracellular ionic calcium concentration ([Ca2+]i) as described previously . Unless otherwise indicated, 800 nM tetrodotoxin was present during measurements. For DAAOx pretreatment of conditioned media samples, the enzyme was dissolved in the same buffer used during imaging, added to conditioned media at a final concentration of 100 μg/mL control, and the mixture was incubated for 7 min at 37°C. Control incubations were performed with media diluted with an equal volume of the imaging buffer. Neurotoxicity was determined by measuring lactate dehydrogenase (LDH) released into the culture medium using a commercial kit (Sigma). Primary cultures from rat hippocampus were plated in 24-well plates, and glia were restricted by a two-day exposure to 1 μM cytosine arabinoside (AraC). Eight days after plating, neurons were treated with pharmacological agents and microglial conditioned medium. Aliquots of culture medium were assayed for LDH 24–48 h later. A survival index was generated wherein the lowest LDH reading from untreated conditioned medium was assigned a value of 100 (% survival) and the highest LDH reading from maximally lysed neurons was assigned a value of 0 (% survival). MTT assays were performed as described previously . For tests of the effect of DAAOx, microglia-conditioned medium was incubated as described above for calcium measurements. As a first test of the role D-serine might play in Aβ-stimulated microglial neurotoxicity, we measured D-serine levels in microglia-conditioned medium. Reverse-phase HPLC was performed on media samples, and conditions were determined under which D-serine could be quantified. Treatment of primary microglia with Aβ1–42 for 20–24 h resulted in a large increase in D-serine in the medium (Fig. 1). The maximal D-serine concentration varied between experiments, ranging from 115 to 660 μM. LPS also evoked an increase in D-serine levels. Neither Aβ nor LPS caused an elevation of glycine levels, which typically approximated the resting levels of D-serine (e.g., Fig. 1B). MTT assays were also performed, excluding any artifacts of cell number or lysis (not shown). 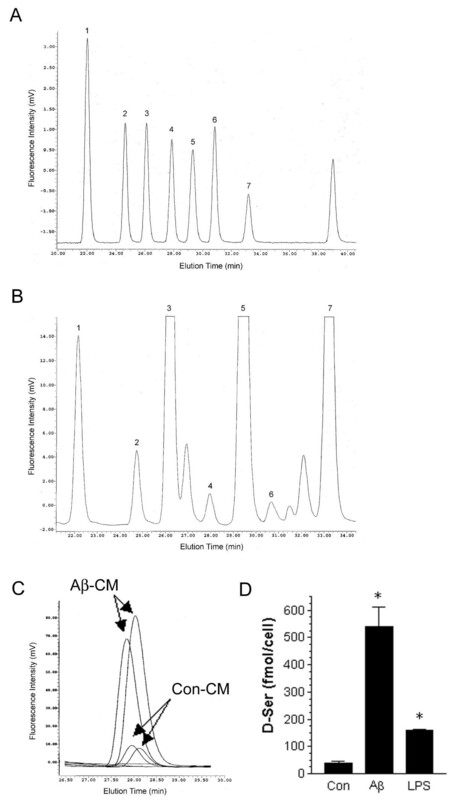 D -serine levels in microglial culture medium measured by HPLC. A. Chromatographic separation of amino acid standards. 1: L-Asp, Rt = 22 min; 2: L-Glu, Rt = 24.7'; 3: L-Ser, Rt = 26.2'; 4: D-Ser, Rt = 27.8'; 5: L-Gln, Rt = 29.3'; 6: Gly, Rt = 30.9'; 7: L-Arg, Rt = 33.2'. B. Chromatographic separation of actual microglia-conditioned medium. C. Primary microglia were incubated 20 h with no addition (Con) or 15 μM Aβ1–42. Tracings are shown for aliquots of media from duplicates of each treatment. D. D-serine values are represented as the mean ± SEM of triplicates (*p < 0.01), and results are representative of three separate experiments. D-serine is produced primarily by conversion from L-serine by serine racemase. This racemase is known to be expressed in protoplasmic astrocytes in vivo. To confirm its expression in microglia, semi-quantitative RT-PCR was performed on mRNA isolated from several culture types. Serine racemase expression was detected in cultures of primary rat microglia and appeared to increase after activation with Aβ (Fig. 2A). We also surveyed microglial cell lines to exclude possible astrocyte contamination. 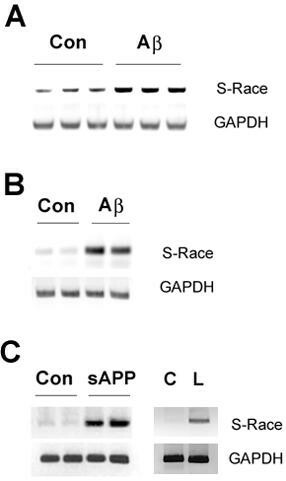 The HAPI rat microglial line contained serine racemase mRNA after treatment with Aβ (Fig. 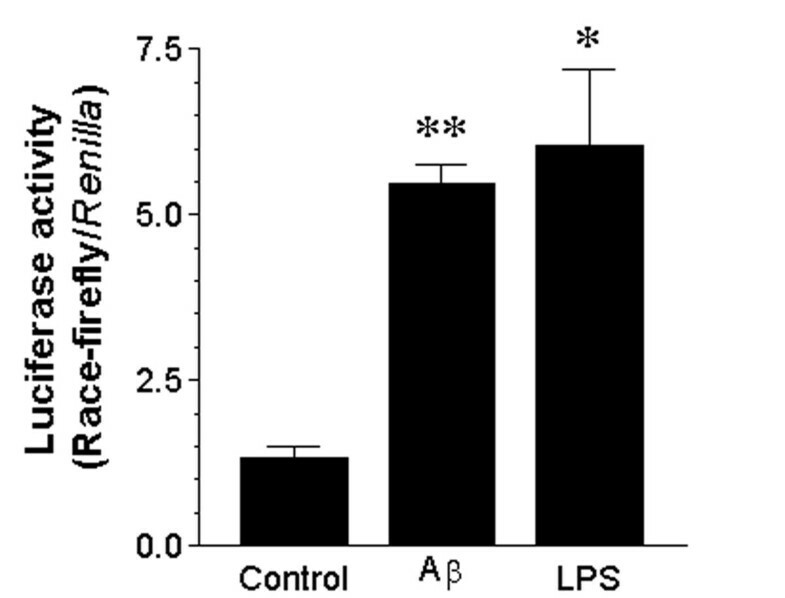 2B), as did the N9 mouse microglial line in the presence two other proinflammatory stimuli: sAPPα and LPS (Fig. 2C). The mouse sequence was subcloned and sequenced to confirm identity. Expression of serine racemase mRNA in activated microglia. Semi-quantitative RT-PCR was performed to detect mRNA for serine racemase and GAPDH in microglial cultures incubated 20 h in the absence (Con) or presence of proinflammatory stimuli. A. Primary microglia treated with 15 μM Aβ1–42. [Densitometric analysis of racemase/GAPDH: Con: 5.12 ± 0.64; Aβ: 9.78 ± 0.3 (p 0.005)] B. HAPI microglial cell line treated with 15 μM Aβ1–42. C. N9 microglial cell line treated with 300 ng/mL LPS or 10 nM sAPPα695. The presence of serine racemase mRNA in activated microglia raised the possibility that increases in expression of this enzyme were responsible for the apparent elevations of D-serine release by Aβ, so western blot analysis was performed on cell lysates from primary microglia. 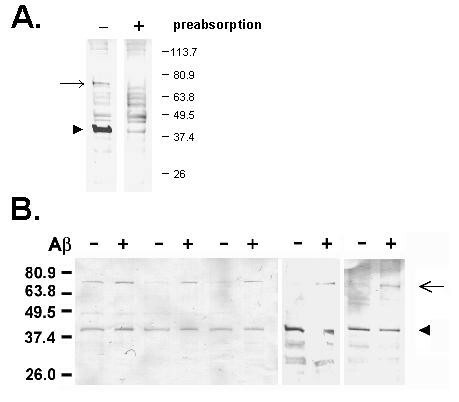 In both cell lysates and positive control samples, the serine racemase antibody detected monomeric protein (~37 kD) and an apparent dimer (~74 kD) (Fig. 3); specificity of the detection was confirmed by a preabsorption control (Fig. 3A). Such oligomers of the enzyme have been described recently and appear to include its soluble, active forms ; as reported in that study, we found the serine racemase dimer to be insensitive to reducing agents. Exposure of primary microglia to Aβ had little or no effect on monomeric serine racemase but resulted in significantly higher levels of the apparent dimer (299% of control) (Fig. 3B). Similar inductions were observed in the HAPI microglial cell line. Induction of serine racemase by Aβ. Serine racemase protein was detected by western blot analysis of lysates of primary microglia. A. Microglial proteins were probed with antibody that either had (+) or had not (-) been preabsorbed to recombinant serine racemase. The detection was intentionally overdeveloped to demonstrate nonspecific bands distinct from the monomer and unreducible dimer. B. Microglia were incubated in triplicate for 12 h either with (+) or without (-) 15 μM Aβ1–42. Arrowhead designates monomer and arrow dimer. Results are representative of three experiments. Densitometry of the dimer in digitized images indicated a significant difference between treated and untreated samples [cntrl: 139.97 ± 54.92, Aβ: 418.52 ± 74.37 (arbitrary units); p < 0.02, unpaired Student's t-test]. To address the possibility of a transcriptional induction of serine racemase, a 1.5 kb sequence 5' to the luciferase coding region was cloned from human genomic DNA. This sequence was placed in the pGL3-basic plasmid for luciferase reporter assays. HAPI microglial cells were transfected with this construct and treated with either Aβ or LPS. After one day of treatment, luciferase levels indicated an induction of the presumptive serine racemase promoter by both stimuli (Fig. 4). Responsiveness of serine racemase promoter to Aβ. The human serine racemase upstream regulatory region was cloned into a firefly luciferase reporter construct. HAPI microglial cells were cotransfected with this construct and a vector encoding Renilla luciferase under control of a constitutive promoter. After transfection, the cells were treated in serum-free medium with 0.3% DMSO ("Control"), 15 μM Aβ1–42 or 100 ng/mL LPS. Luciferase activity was measured after 24 h and is represented as firefly luciferase signal, relative to Renilla luciferase signal in the same well (mean of quadruplicates ± SEM; * p < 0.02; ** p < 0.001). Results are representative of three separate experiments. Previous experiments demonstrated a release of glutamate by microglia activated with sAPP and Aβ. Useful in those studies were bioassays in which hippocampal neurons were monitored for intracellular ionic calcium concentration ([Ca2+]i) during application of conditioned medium collected from control or activated microglia . As an initial step to determine if proinflammatory activation of microglia might evoke release of NMDA-R agonists other than glutamate, we sought conditions suitable for detecting ligands of the glycine/D-serine site of the NMDA receptor. With no other manipulations, application of glutamate to hippocampal neurons elevated [Ca2+]i to levels that were partially inhibited by a glycine/D-serine site antagonist, 5,7-dicholorokynurenic (DCKA), suggesting synaptic release of endogenous glycine. To circumvent this effect in bioassays of conditioned medium, tetrodotoxin (TTX) was employed. This intervention resulted in a [Ca2+]i response to glutamate that was smaller and insensitive to DCKA (data not shown). Therefore, 800 nM TTX was included in subsequent bioassays of microglia conditioned medium. Under these conditions, graded responses to D-serine could be detected at concentrations from 3–100 μM (data not shown). Bioassays were performed on conditioned medium from primary microglia activated with either Aβ1–42 or LPS. Hippocampal neurons responded to such media with a rapid increase in [Ca2+]i (Fig. 5). Conditioned medium from Aβ-treated microglia evoked a modest response at a dilution of 1:100 into the imaging buffer; a 1:18 dilution elevated [Ca2+]i dramatically. Medium from LPS-treated microglia had a similar effect (Fig. 5B). By contrast, the conditioned medium from unactivated sister cultures showed no effect on neuronal [Ca2+]i at ratios up to 1:18 (Fig. 5A) and evoked only a modest increase at 1:10 (Fig. 5B). Acute treatment of neurons with equivalent amounts of Aβ or LPS had no significant effect on [Ca2+]i. DCKA (100 μM) reversed the [Ca2+]i response to microglia-conditioned medium. The elevation was also sensitive to more general antagonists of the NMDA receptor (data not shown). As an independent test of the role of D-serine in the calcium responses evoked by microglia-conditioned medium, samples of media were incubated with D-amino acid oxidase (DAAOx) to remove D-serine; catalase was also added to the imaging buffer to obviate effects of H2O2 produced by the DAAOx. Treatment with DAAOx dramatically lowered the ability of microglia-conditioned medium to evoke a [Ca2+]i response (Fig. 5C). Similar elevations of a DAAOx-sensitive NMDA agonist were observed in medium conditioned by the HAPI microglial cell line. Several controls for the specificity of the DAAOx treatments were performed (data not shown): i. exogenous glycine was able to overcome the effect of DAAOx, confirming independence from hydrogen peroxide or similar artifacts of the DAAOx treatment; ii. when samples of conditioned media were treated with DAAOx that had been heat-inactivated, there was little difference from untreated media samples; iii. DAAOx was shown to be specific for D-serine under the conditions of incubation by tests in which the enzyme was incubated with [14C]glycine or [3H]D-serine, subsequently analyzed by thin-layer chromatography. Elevations in apparent D -serine detected by neuronal bioassay. Primary hippocampal neurons were monitored for [Ca2+]i during the application of conditioned medium (CM) from microglia (for the period indicated by the lower bar). DCKA (100 μM) was added as indicated by the bar thus labeled. A. Microglia were cultured 20 h in the absence (evenly dashed line) or presence of Aβ1–42 for 20 h. CM from Aβ-treated cultures was added to the neurons at either a 1:100 or 1:18 dilution. B. Microglia were cultured 20 h in the absence (dashed line) or presence (solid line) of 300 ng/mL LPS. Both samples were added to neurons at a dilution of 1:10. C. CM from Aβ-treated cultures was incubated with DAAOx or a control buffer, then applied to neurons at a 1:18 dilution. Similar results were obtained with conditioned medium from LPS-stimulated microglia. To explore the ramifications of D-serine release, we tested the influence of D-serine on neuronal health. Primary hippocampal neurons were exposed to 1 or 3 μM D-serine, and effects on metabolic activity were monitored by MTT assay the following day. Treatment with 1 μM D-serine lowered MTT values to 71.1% of control (±8.08), and 3 μM D-serine resulted in a value that was 11.54% of control (±7.50). D-serine also generally potentiated the toxicity of low levels of glutamate (data not shown). We next tested whether D-serine played a requisite role in the neurotoxicity exhibited by Aβ-treated microglia. Primary microglia were left untreated or were exposed to Aβ overnight. Conditioned medium from these cells was applied to cultures of primary hippocampal neurons (Fig. 6). A higher rate of LDH release was observed in the presence of conditioned medium from Aβ-treated microglia compared to that obtained from untreated microglia. As a control for the potential neurotoxicity of residual Aβ carried over with the conditioned medium, an aliquot of Aβ was diluted into culture medium in a cell culture dish lacking cells and incubated under identical conditions; treatment of neurons with medium thus prepared showed no significant toxicity under the conditions of our assay (not shown). The neurotoxicity resulting from Aβ-activated microglia was partially reversed by inclusion of 1 or 10 μM DCKA (Fig. 6). Furthermore, pretreatment of the conditioned medium from Aβ-treated microglia with DAAOx also partially reversed its neurotoxicity. Because DAAOx can generate hydrogen peroxide, a separate treatment was tested utilizing catalase, but this did not alter the effect of DAAOx (data not shown). Suppression of microglial neurotoxicity by DCKA and DAAOx. Primary microglia were treated for 24 h in the absence (Con) or presence of 15 μM Aβ1–42 (Aβ). The conditioned medium from these cultures was then diluted four-fold into the medium of primary hippocampal neuron cultures; neuronal viability was measured 24 h later by LDH release. 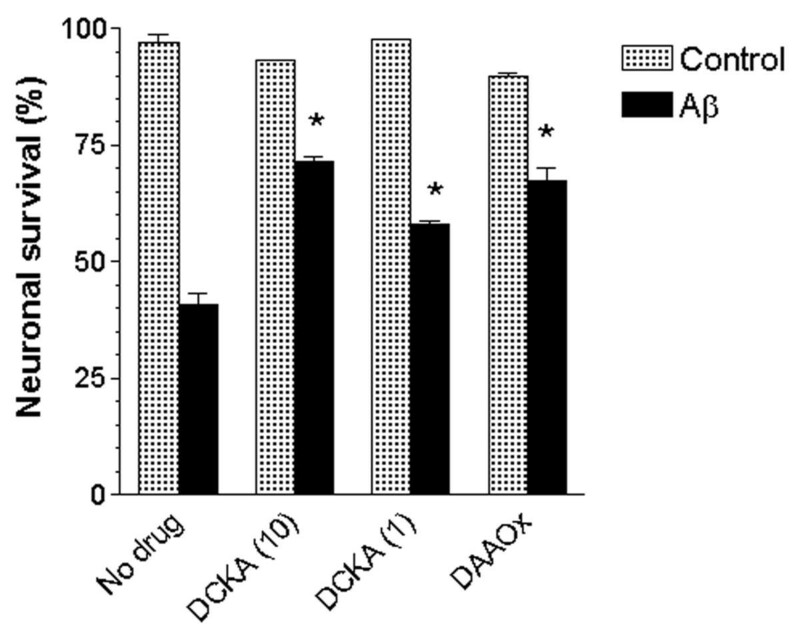 Some neuronal cultures received simultaneous application of 1 or 10 μM DCKA, and additional sets were exposed to microglia-conditioned medium that had been pre-treated with DAAOx. Values represent the mean ± SEM of triplicate determinations, and the results are representative of three experiments (*p < 0.01 versus "no drug, +Aβ"). Similar data were obtained using MTT reduction as an index of viability. Based on the inductions by Aβ and other proinflammatory stimuli, the levels of expression of serine racemase in AD brain tissue were examined. RT-PCR of mRNA isolated from hippocampus of AD indicated a significant elevation of serine racemase expression compared to age-matched controls (AMC) (Fig. 7). Within the AD group alone, the female subjects showed a nonsignificant trend towards higher levels than the male subjects. The AD pool contained a higher percentage of females, creating the possibility that gender contributed to the difference observed. However, the difference between AD and AMC was significant within males alone (ratios of racemase:GAPDH signals, AD: 1.62 ± 0.342; AMC: 0.447 ± 0.024; p < 0.05). The studies presented here document the capacity of activated microglia to express serine racemase and release D-serine, thereby implicating D-serine as a contributor to the neurotoxicity exhibited by inflammatory situations in the CNS. Microglia stimulated with Aβ or LPS released D-serine, a potent NMDA receptor coagonist. The conditioned medium from such microglia elevated [Ca2+]i in cultured hippocampal neurons in a manner that was largely reversed by D-serine/glycine-site antagonists, as well as more general antagonists of NMDA receptors. Pretreatment of the conditioned medium with DAAOx also blocked the effects on neuronal [Ca2+]i. Aβ treatment elevated the steady-state levels of serine racemase mRNA and protein, suggesting that increased synthesis may be involved in the release of D-serine observed under these conditions. Finally, a potential role for D-serine in Alzheimer's disease was further implicated by the observation that serine racemase mRNA is elevated in Alzheimer's brain tissue. D-serine has gained increased scrutiny as a NMDA receptor agonist that may be more important than glycine in vivo, at least in specific regions or developmental stages. However, the potential contribution of D-serine in excitotoxic pathologies has not received much attention. Damage resulting from intracortical infusion of NMDA is attenuated by an inhibitor of poly-ADP ribose polymerase (PARP), and this neuroprotection was associated with a depression in the levels of D-serine but not glycine . Conventional wisdom held that D-serine/glycine sites on NMDA receptors are typically saturated in vivo, making elevations in their agonists irrelevant. However, this idea has been refuted for over a decade now by observations of responsiveness to infused glycine . Similarly, applications of D-serine have shown dramatic physiological effects [9, 10, 23, 24]. One set of results indicates that much of the biological action of exogenous D-serine may come from stimulation of extrasynaptic NMDA receptors . To the extent that the actions of D-serine on NMDA receptors replicate those of glycine (perhaps, even more potently), the vast literature on exogenous glycine in excitotoxicity paradigms can be translated to D-serine. But issues of production, release, uptake, and catabolism appear distinct for these two glutamate co-agonists, making studies of D-serine a distinct priority. Release of D-serine from astrocytes can be stimulated by non-NMDA, ionotropic glutamate receptor agonists . This fact has led to the hypothesis that the synaptic elements of astrocytes may contribute to synaptic efficacy by participating in a positive-feedback loop whereby neuronal release of glutamate stimulates astrocytes to release D-serine and further amplify NMDA receptor activation . Recently, data were published consistent with the possibility that serine racemase is activated by direct binding of calcium ; notably, AMPA/kainate receptor activation elevates intracellular calcium levels in astrocytes . Therefore, a global release of glutamate – or, in fact, any strong calcium agonist – may lead to extrasynaptic release of D-serine, from both astrocytes and microglia. Similar to its effects on neurons, Aβ can elevate [Ca2+]i in microglia , as can LPS . To wit, the degree of elevation in D-serine released into medium was surprisingly high given the changes in serine racemase protein levels, suggesting that some of the Aβ-evoked increase in D-serine release may have come from stimulation of enzyme activity, in addition to expression levels. Detailed time-course analyses of protein levels and D-serine release may provide some insight into this question. In the experimental paradigms applied here, the presumptive actions of D-serine in microglia-conditioned medium were attenuated by DAAOx. Under the normal conditions of neurotransmission, glutamate concentrations at the synapse are reduced primarily by astrocyte uptake . The mechanisms controlling D-serine concentrations are less clear; the relative contributions of degradation (e.g., by DAAOx), glial uptake, or diffusion out of the synaptic cleft are topics of ongoing research. There appears to be a transporter for D-serine at the synapse , but it is incompletely characterized. Neuronal uptake, perhaps to replenish presynaptic stores, would be consistent with the finding that some pyramidal neurons in the cerebral cortex and neurons in the nucleus of the trapezoid body contain D-serine . Degradation of D-serine by DAAOx produces hydrogen peroxide, creating potential for additional harm. However, the concentrations of peroxide predicted from this reaction would be make a relatively minor contribution to neuropathology compared to the potent synergistic activation of NMDA receptors by D-serine and glutamate. A role for excitotoxicity in CNS inflammation is becoming well established. One of the first analyses of the relative roles of various neurotoxins released by activated microglia found that NMDA receptor antagonists were the most efficacious neuroprotectants . Subsequently, Giulian et al. described an excitotoxin released from microglia exposed to amyloid plaques. Excitotoxicity appears to contribute to neuronal damage in more general models of inflammation as well, such as intracerebroventricular LPS infusion . Several studies have concluded that nitric oxide (NO) mediates microglial neurotoxicity because inducible NO synthase (iNOS) responds to proinflammatory stimuli and general NOS inhibitors can be protective in micoglia-neuron cocultures . However, most such experiments cannot distinguish between NO generated by microglia versus that generated by the neurons themselves through classic excitotoxic mechanisms . When corrected for Ki, inhibitors selective for neuronal NOS are more potent protective agents than are iNOS-selective compounds , suggesting that the primary neurotoxic agents microglia produce are excitotoxins that activate nNOS to produce NO within the neurons themselves. Previously, Li et al. showed that microglial cells synthesize and release IL-1 in response to conditioned media obtained from glutamate-stressed neurons. The neurons respond with an increase in expression and processing of βAPP. Secreted APP and Aβ can stimulate proinflammatory activation in microglia [13, 18], including the release glutamate [12, 39]. These data are consistent with the plethora of evidence linking inflammatory mechanisms to AD pathogenesis . Together with the potential for such stimuli to also trigger release of D-serine, these findings suggest that a vicious circle of inflammation and excitotoxicity may be important in AD pathogenesis. Excitotoxic events are a common aspect of many forms of neurodegeneration, even when they occur secondarily to ischemia or trauma, and considerable evidence suggests that excessive stimulation of glutamate receptors occurs in AD [1–3]. Free D-serine concentrations are reported to be unaltered in the Alzheimer brain [41, 42]. However, one study found an elevation of overall serine levels in AD CSF per unit volume, but when normalized to protein concentration, the serine levels were similar between AD and controls , suggesting that elevated protein levels in AD CSF could confound analyses and interpretations. Our initial analysis here indicates that there is an elevated steady-state level of serine racemase mRNA in AD hippocampus versus age-matched controls. Nevertheless, the elevation of D-serine itself might be expected to occur early in the disease progression; thus, any elevation might be difficult to detect after the disease has progressed to its final stages. Our semi-quantitative analysis showed that the mRNA for serine racemase was increased in AD brain nearly three-fold relative to age-matched controls. It is possible that a portion of this difference can be accounted for by the hypothetical increase in numbers of astrocytes in AD. However, a similar analysis of GFAP mRNA in AD reported levels to be only 57% higher in AD than in controls , and this effect includes an augmented expression per cell . A recent microarray analysis of AD concluded that GFAP mRNA could not be compared to controls reliably due to variability across post-mortem interval, agonal state, etc . In conclusion, Aβ and other AD-relevant proinflammatory stimuli are capable of stimulating release of D-serine from microglia. Together with the release of glutamate evoked by similar conditions, a cooperative activation of NMDA receptors could be anticipated. In addition to delineating details of the mechanisms by which CNS inflammation harms neuronal elements, this line of evidence may be relevant to the development of therapies. If approaches targeting the general inflammatory system or glutamatergic neurotransmission are accompanied by unacceptable contraindications, a more specific interference with D-serine production or release may be more useful in AD and other neurodegenerative conditions. For this reason and others, it will be important to elucidate the mechanisms controlling D-serine synthesis, degradation, and transport under normal and pathological situations. Supported by the National Institute of Aging (R01AG17498 & P01AG12411). We greatly appreciate Dr. Camilo Rojas (Guilford Pharmaceuticals), who generously provided recombinant serine racemase for preabsorption antibody controls, as well as helpful discussions. Richard Jones also provided technical assistance. Author 1 (S-Z.W.) performed the calcium measurements, neuronal survival experiments, DAAOx controls; participated in RT-PCR; cloned the racemase promoter and performed the luciferase assays; and composed the first draft of the manuscript. Author 2 (A.M.B.) produced the primary microglial cultures, performed western blot analyses and participated in the neuronal survival experiments. Author 3 (M.M.P.) was primarily responsible for RT-PCR. Author 4 (W.S.T.G.) provided the RNA samples from characterized human cases and controls. Author 5 (A.S.B.) performed the HPLC measurements and participated in the design of the study. Author 6 (S.W.B.) conceived of the study, participated in its design and coordination, performed feasibility studies for the calcium measurements and neuronal survival assays, and wrote the final draft of the manuscript. All authors read and approved the final manuscript.